Be it his own fault or not there has always been a circus surrounding Nicklas Bendtner. When he first burst onto the scene as a 17-year old at Arsenal much was promised but not an awful lot followed. Life started well at Arsenal. He joined in 2005 and formed a prolific partnership with Arturo Lupoli in the reserves. Arsene Wenger hoped this would continue in the first-team. Wenger eased him into life at the North London Club, playing him just three times in the League Cup appearances in the 2005/06 season before being loaned to Birmingham City. Birmingham, clearly impressed with his input early on, extended the initial loan which was only meant to be until January, until the end of the season. In the 2006/07 season, he made 48 appearances in all competitions, scoring 13 goals. Whilst these numbers don’t jump off the page, it is pretty good going for a teenager in their first full season in English football. This was a promising start to his career in England and as a result Bendtner earned his chance in Arsenal’s first team. Following his return to Arsenal, things did not go according to plan. Moves to A.C Milan and Olympique Lyonnais were reportedly on the table, but the Dane wanted to fight for his place at his current club. Bendtner was given opportunities, largely when Robin Van Persie was rested. The problem was he often shared the field with, Emmanuel Adebayor. Another character, it is easy to see why the two may clash and they did. During a 5-1 League Cup semi-final loss to rivals Tottenham Hotspur, the pair engaged in a heated argument. It took captain, William Gallas and the referee to split them. Not only were they going to clash personally, but with similar styles of play, it is hardly surprising that they failed to click. In 40 total appearances (17 starts) in the 2007/08 season, Bendtner netted just 9 goals. Things never really went as well as he had hoped at Arsenal. He scored 15 in 50 (27 starts) in 2008/09, 12 in 31 (21 starts) in 09/10 and 9 in 32 (14 starts) in 10/11. His 12 goals in 31 appearances in 2008/09 was his best effort in an Arsenal shirt, scoring a goal every 2.5 games. Bendtner made one appearance in 2011/12 for Arsenal before being shipped out on loan to Sunderland. 2011/12 was the first time Bendtner played for another Premier League side, after joining Sunderland on a season-long loan. His loan spell ended with 8 goals in 28 appearances. This was enough to finish as Sunderland’s top goalscorer in the league and joint in all competitions with Sebastian Larsson. The ratio was very similar to previous seasons (1 goal every 3.5 games) but this was in a struggling mid-table side. Expectations had to be tempered when the club as a whole scores less and the players around him are not of the same quality. The Denmark international had clearly done enough to impress others though, even if not his parent club. In the 2012/2013 season Bendtner moved to Turin to play for the eventual Serie A champions, Juventus. Injuries limited Bendtner’s chances at Juventus, and as a result he only made 9 appearances. He failed to score during his time in Italy. Moves abroad don’t always work out for players and it clearly didn’t this time around. An unsuccessful season on his return to Arsenal followed. He made just 14 appearances (4 starts) and he was later released in 2014. Wolfsburg were the latest club to take a chance on the then 26 year-old. In two seasons with the Bundesliga club, he scored 9 goals in 47 games (11 starts). He did manage 4 goals in 8 Europa League games in the 2014/15 season, which was a fairly impressive return. Given his limited starts, you could excuse the lack of goals. Clearly he did not do enough to warrant the starts, so in general his time in Germany was unsuccessful. With the deal complete, Bendtner will make his return to English football after a two-year absence. This will be the first time since the loan spell at Birmingham in 2006/07 that he will play football in the second tier. With a good goal-scoring strike partner in Britt Assomobalonga (assuming Forest play two up front), Bendtner could easily flourish. As it stands, Forest have signed an international striker, who at 28 should be in his prime. Currently that isn’t the case, but a good season at the City Ground can change that. It is easy to dismiss that Bendtner has played and scored at the highest levels of both club and international football. Despite the negatives he clearly has a wealth of experience, which could count for a lot in this division. His tally for Denmark (29 in 72) is his best ratio at any level. Whilst egotistical, even Bendtner will feel he has a point to prove and will realise he has a shot at redemption. There is a sombre feeling in the air around the City Ground, with the departure of promising winger, Oliver Burke. Burke was probably good for 15 goals this season, a void Forest fans will now look for Bendtner to fill. Should Bendtner start 30 games this season, 15 goals seems a realistic target. The jury should remain out until he’s got a good few games under his belt at Forest. Come Christmas time he should have settled and barring injuries or lack of playing time, he should be amongst the goals. If he is not questions will be raised. The signing will come into question and negativity will kick in once more. Phillipe Montanier has opted for one striker all season, but this may be due to lack of two top-quality strikers available to him. The club, fans and the manager will be hoping that Assombalonga and Bendtner can strike up a good understanding early on. Henri Lansbury who was at Arsenal during Bendtner’s time in North London may be asked to help him settle. Forest have arguably one of the strongest midfield’s in the Championship, which can only help Bendtner’s bid for goals.. After an improved defensive showing in a 3-1 win against Leeds United, there is reason for optimism around the City Ground. Scoring goals hasn’t been an issue so far this season. Forest have found the net 11 times this season, one less than top scorers Barnsley. It is the fact they have conceded the same amount that has held them back. Sitting 7th in the league and through to the third round of the League Cup is a reasonable start. It is still early in the tenure under new boss, Montanier. 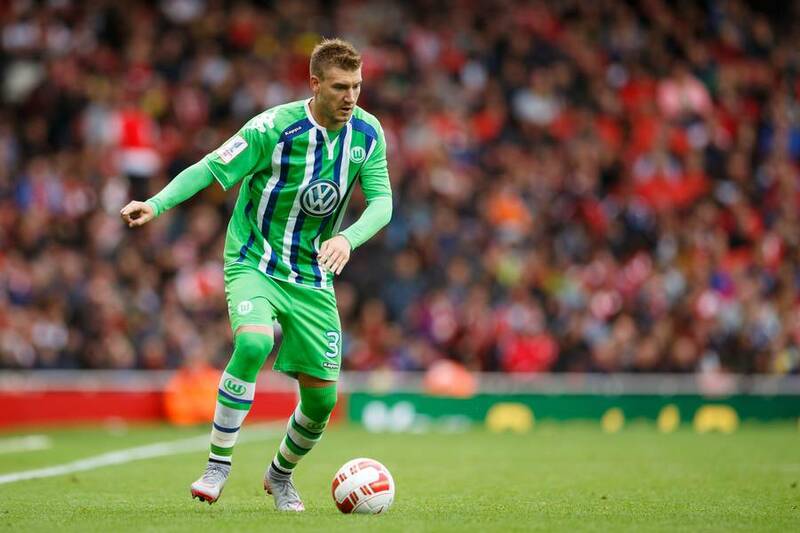 Forest will play Bendtner’s former employers, Arsenal in the League Cup on 20th September. If available and selected, Bendtner will have the chance to hit the ground running against Aston Villa on Sunday. Bendtner’s first game in front of the home fans could come against Norwich City on 17/09.